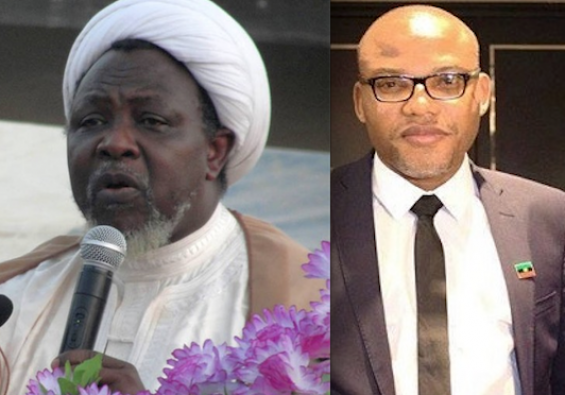 THE continued detention of the leaders of the Indigenous People of Biafra (IPOB), Nnamdi Kanu and Islamic Movement of Nigeria (IMN) Ibrahim El Zakzaky has yet again drawn the attention of a human group, Access to Justice (AJ). This was stated in a press briefing addressed in Lagos by its Deputy Director, Dr. Adenike Ayedun. The human rights body urged the federal government to obey court orders and release without delay the above-named detainee who have been granted bail by Nigerian courts of competent jurisdiction. Failure to implement court orders, the body warned, could lead to disorder and anarchy in Nigeria. AJ argued that failure to obey court orders, especially the ones affecting the fundamental human right of some Nigerians could endanger democracy and the rule of law. Speaking further, the body specifically expressed a surprise for “willful disregard of the rule of law by continuing to detain the leader of the Islamic Movement of Nigeria, (IMN), Ibrahim El Zakzaky since December 14”, and the detention of Nnamdi Kanu and others who were granted bail by the Federal High Court. It argued, “No government that avows respect for the Constitution and human liberty can afford to behave in this audacious and autocratic manner.